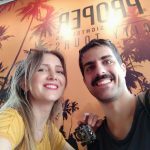 What happens when you have only one day to spend in Los Angeles yet still want to explore the whole city? First of all do not panic! We found the perfect way for exploring everything in a day, and let us present to you Proper Sightseeing’s Hop-On Hop-Off bus tour! 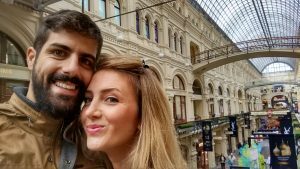 A tour in Los Angeles in an educating and entertaining way, conveniently stopping at key places of interest. On the tour, you will see the absolute best that the city has to offer from historic Hollywood, to glitzy Beverly Hills, to the Trendy Sunset Strip and everywhere in between! 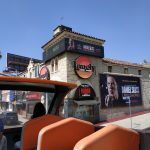 After visiting LA Downtown and having checked the starts at Walk of fame and the amazing Dolby theater in Hollywood we crossed across the street and found ourselves in a beautiful place, easily recognizable by its vivid orange colour! Time to meet Proper Sightseeing and its team! Jackie, Tony and the best driver ever David were there to welcome us in the warmest way! Extraordinary vibes and passionate people eager to explain any details about the tour just to make sure that all passengers would make the most out of it! The crazy orange bus is there for us and the adventure begins! You can start at any of the stops you wish and of course take your time sightseeing after hopping off the bus! You have the freedom to hop-on and hop-off as many times as you’d like. Sit back, relax on fully cushioned seats, and explore one of the globe’s most creative and expressive cities in a manner, and at a speed, that suits your interests! shopping center. Come in & purchase your sightseeing tickets! The friendly staff we ll help you out! location is best known to be a place where famous musical artists and bands have imprinted their hands. Third stop is recognized as “the #1 comedy club in the country” by USA Today. Great stop to enjoy a stroll down Sunset Strip & all the area’s most famous hotels! of the first to perform here when it opened. Sunset Strip, which is known for the famous wall-to-wall colorful billboard ads, notorious bars, nightclubs, rock clubs and more! WEST HOLLYWOOD offers amazing food and beverage options. Beverly Hills. This city is comprised of the most luxurious shopping, dining, and hotel destinations in the world. and Michael Kors inside. Nearby is LA’s famous Restaurant Row featuring notable restaurants such as The Original Lawry’s Prime Rib, Fogo de Chao, The Stinking Rose and more! from Petersen Automotive Museum’s rare car collection. CBS studios, where The Price is Right, Dancing with the Stars, and American Idol are filmed. dining choices and wonderful local shopping makes this stop a must! Don’t forget to stop at Pink’s Hotdog stand where you can get one of the most delicious hot dogs in LA or even possibly spot a local celebrity getting their grub on. Make sure you bring cash if you want a hot dog! studio is the final resting place for Hollywood’s founders, stars, directors, writers, and performers at The Hollywood Cemetery. 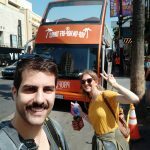 So travellers all you have to do is relax and explore the City of Los Angeles at your own pace on our fantastic Hop On Hop Off tour and spend time at the most famous locations! This team is full of energy and passion for what they do! The Proper Sightseeing’s Hop-On Hop-Off tour was complimentary though all the opinions expressed above remain our own and they are based on our personal experience! Totally recommended!!! Many thanks for the amazing experience!